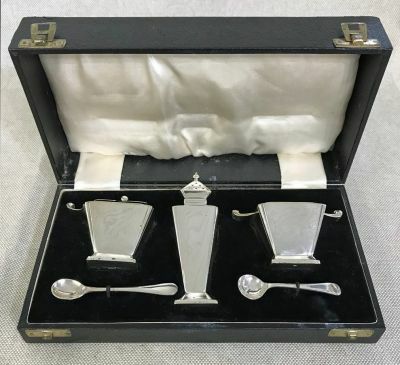 Art Deco silver plate condiment set in original presentation box. Comprised of salt cellar with spoon, mustard pot with spoon and a pepper pot. Marked Marlborough, made in England, circa 1935. The pepper pot is 4” high. The box is 5 1/4” by 9 1/2”, 2 1/2” high.